Norman Mailer was a galvanizing public speaker and a supremely talented writer, but he was not a great filmmaker. His misguided and wildly indulgent movies are imminently watchable, though, if only because they serve as valuable time capsules and offer quite a lot of wonderful posturing and surprisingly funny dialogue (intentional and unintentional). Norman Mailer (l.) and Rip Torn go at it in 1970's Maidstone. Aside from one later, scripted but equally overwrought effort (Tough Guys Don’t Dance, 1987), Mailer’s two-year career as a filmmaker is captured in Criterion’s latest Eclipse collection, Maidstone and Other Films by Norman Mailer, a two-disc set. The three films included here were shot by expert cameramen, among them legendary documentarians Richard Leacock and D.A. Pennebaker (The War Room), and starred (aside from Mailer) talented NY theater performers. The top-notch talent involved in the creation of the filming were undercut, however, by Mailer’s decision to have actors improv long, directionless scenes where the dialogue swings wildly between creative cursing and awkwardly poetic pronouncements. Mailer was inspired by Andy Warhol’s minimalist film experiments (which he disliked but respected for their minimalism), but his cinema was a far talkier one, influenced by booze instead of drugs. 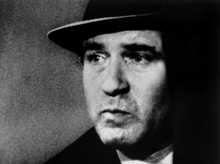 His first film, Wild 90 (1967) is composed of a series of long improvisations by Mailer and his actor friends Mickey Knox and Buzz Farber as a trio of foul-mouthed mobsters. The film’s most distinctive characteristic is its inaudible soundtrack (soundman Bob Neuwirth wasn’t quite the right man for the job). Eclipse has compensated for this bizarre deficit by offering subtitles for the film that allows viewers to read the dialogue that can’t be understood (which is more than half of the picture). Norman Mailer in his 1968 film Beyond the Law. The second picture, Beyond the Law (1968), is a more complex bit of faux cinema verité that depicts one night in the lives of a group of plainclothes police detectives. The cast contains some familiar faces — Rip Torn (playing a biker named “Pop Corn”), Marsha Mason and George Plympton (as a Lindsay-like NYC mayor) — but it suffers from the same unintentionally funny indulgences as its predecessor. Chief among these is Mailer’s starring performance, where he slips from his usual clipped, closed-mouth way of speaking into a broad Southern drawl and then a final swerve into a ridiculous Irish brogue. Mailer’s most ambitious film, Maidstone (1970), is the centerpiece of the set and without a doubt one of the craziest and least successful, yet compulsively watchable, “underground” films of the Sixties. The central problem with the film is that Mailer overplotted the opening scenes — in which a presidential candidate directs a male rendition of Buñuel’s Belle de jour (!) while assassins plot all around him — and then dropped the plotline any time it was convenient. After the film shoot was finished, costar Rip Torn (The Larry Sanders Show) decided Maidstone needed a decisive end, so he chose to “assassinate” Mailer with a hammer. The attack, which developed into a real physical fight between the two, was captured by cameramen that Torn had beckoned to the location. The scene is unpredictable and electric, and the angry, oddly conceptual conversation between Torn and a bleeding Mailer that follows underscores the fact (later admitted by Mailer) that Torn did supply the perfect ending for the film. For the few minutes that Torn wrestles (literally!) authorship of the film away from Mailer, the proceedings are crackling with intensity and qualify as pure and perfect cinema verité. As flawed as it is, Maidstone is thus worth a look to see the very odd sight of a performer serving as a surrogate for both a film critic and the viewer in reminding the director how badly he’d gone off the rails from his original conception.